dotConnect for SQL Server, formerly known as SQLDirect .NET, is an enhanced data provider for SQL Server that builds on ADO.NET technology and SqlClient to present a complete solution for developing SQL Server-based database applications. As part of the Devart database application development framework, dotConnect for SQL Server offers both high performance native connectivity to SQL Server and a number of innovative development tools and technologies. dotConnect for SQL Server introduces new approaches for designing application architecture, boosts productivity, and leverages database application implementation. By providing access to the most advanced database functionality, dotConnect for SQL Server allows developers to harness the full capabilities of the SQL Server and optimize their database applications. dotConnect for SQL Server stands out as the set of components with the widest support of SQL Server functionality. The goal of dotConnect for SQL Server is to enable developers to write efficient and flexible database applications. The dotConnect for SQL Server assemblies are implemented using optimized code and advanced data access algorithms. Components undergo comprehensive performance tests and are designed to help you write thin and efficient product data access layers. dotConnect for SQL Server has rich set of design time tools that leverage the development process greatly. Particularly, there are convenient design time component editors, wizards and managers for typed SQL Server-specific components, toolset for live data binding, cross-form components cooperation, and much more. dotConnect for SQL Server integrates tightly with Visual Studio 2008 - 2019 and Delphi. dotConnect for SQL Server combines connected and disconnected data access models in single SqlDataTable component, which allows you to design more flexible application architecture and use full power of data binding. dotConnect for SQL Server supports new ADO.NET features and technologies as soon as they are released. This includes base-class-based provider model, provider factories, connection string builder, metadata schemas, asynchronous commands, pooling enhancements, batch update support, provider-specific types, server enumeration, database change notification support and so on. dotConnect for SQL Server will continue supporting the newest standards and innovations of the .NET Framework. 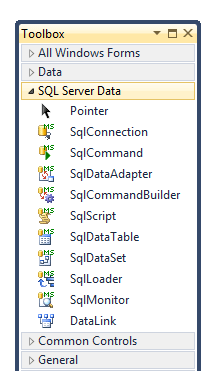 The following list describes the main features of dotConnect for SQL Server. Send us a link to your MVP profile and get a free license for any SQL Server product! You can get a significant discount, and even a free license, by spreading a word about dotConnect for SQL Server.